It’s very possible that many people’s first encounter with Werner Herzog’s 1972 German epic Aguirre, der Zorn Gottes (Aguirre, the Wrath of God) will be through the cinephilic references in Me and Earl and the Dying Girl. After the first ten minutes my mother declared, “This is terrible!” and left. With patience and some guidance, I think just about anyone can enjoy this film, or at the very least understand why it is regarded as one of cinema’s best and most artistic films. This review will analyze the allegories and how they are expressed through the aesthetics. Prima facie the film is simple. Adapted from the eyewitness account of Gaspar de Carvajal, a Spanish missionary, Aguirre, the Wrath of God portrays a fictional voyage by conquistadors to El Dorado–the city of gold. Along the way, the leading imperial power sends a smaller troop to scope out the land. He puts a lower nobleman in charge, who is overthrown by Don Lope de Aguirre, originally second in command. During the trek, conquistadors die off one by one through disease, starvation, mysterious arrows (which appear to come out of nowhere), fatigue, and madness (which sets in as reality and myth blur). The folly and absurdity of Aguirre’s hubris takes over and he is eventually left alone on a raft with hundreds of monkeys. Aguirre, The Wrath of God is an allegory of the madness that took over Germany during the Nazi’s reign. There are uncanny similarities between Aguirre’s journey to El Dorado and Hitler’s conquest of Europe: the lack of respect for other cultures, the enslavement and murder, the imperialist ambitions, the hubris, and the guiding myths of superiority of race. When Hitler came into power, Germany was depressed with hyper-inflation caused by the reparations of the First World War. In this harsh jungle of uncertainty he held onto this myth of a superior Germany that would find the golden city. The film is also an allegory for colonialism in general and the absurdity of the myths that guide it. It tracks the colonizers’ lack of respect for the native culture, the absurdity of taming and claiming a piece of land just by saying it’s yours, and the destructive greed that guides the entire endeavor–the colony only exists to serve the mother country and therefore should be exploited. There is a nearly two-minute interlude in the film where a native Amazonian plays an exotic instrument as Aguirre ignores the beauty of the man’s song, looking away in contempt or peering at him with judgement. In a single, simplistic, and well-composed image Herzog captures the colonial mindset, the riff in communication, the tragedy in the act, and the evil motivating it. By walking through the land the conquistadors immediately assume they can own and tame it. They are blinded by their greed and don’t see how they are hurting others and themselves. Aguirre even says “the earth I pass will see me and tremble,” but it is the suffocating nature that kills and drives these men to madness. Their attempt to own the land simply by calling it their own is squandered as the terrain itself seems to fight back. Wrath of God is simultaneously baffling and haunting. It’s a comedy and a tragedy, myth and reality–an ironic film teeming with paradoxes. Even in the opening minutes the tone is split. Like many historical films, Wrath of God begins with expository text that feels like legend–think “a long time ago in a galaxy far, far away”–yet the film couldn’t be any more aware of the doomed nature of the mission. The conquistadors are searching for a city of gold from the myths of the Amazonian Indians; there are no riches, only the greedy delusions of evil men. The further they venture into the jungle, the further they become engrossed in fantasy. The beginning of the film holds a mythical promise- like the hope Hitler inspired or the potential of riches that colonizers feel, but this illusion is questioned by the realist aesthetic. When we are first introduced to the conquistadors in a hazy cloud, they are walking across a mountain pass like “knights in shining armor.” However, if Herzog were merely making vicarious hagiography, he wouldn’t call into question the hubris. Their apparel, which is a signifier of nobility and triumph, becomes an annoying obstruction; the Spaniards are obviously improperly dressed for this journey, as they clumsily hike through the Amazon. What at first, on a mythical level, seems to be a symbol of mastery, devolves into a nuisance. Throughout the film, Herzog is constantly mystifying his characters before showing the harsh reality. Thus, on an allegorical level it depicts the guiding myths of colonizers and specifically the Nazis while questioning these beliefs through the harshness of the terrain. Aesthetically this is created through the seemingly unfitting choice to shoot this legendary, historical epic guerilla style. Drawing from the conventions of neo-realism and direct cinema, Herzog is constantly calling into question the grand illusions of his characters by shooting them in a grounded, realistic way. We hear them talk of a city of gold, but all we see is that they stumble through the mud and aimlessly drift down the river. The film is shot handheld and framed on-the-fly without the guidance of storyboards. Herzog plants his camera in the middle of the action as though it were another conquistador struggling to navigate through the Amazonian jungle: mud dirties the lenses and trees obstruct the view of characters. Other times the film utilizes documentary conventions when characters look directly into the camera to almost address the audience directly. However, in the latter half of the film, after all hopes of these guiding myths have been crushed, the film ventures into the madness of the characters. The guiding myths have already been proven false and we know this quest will end badly, but the characters hold onto their fantasies despite their better instincts. What was at first documentary style realism becomes oneiric. Herzog’s camera, which was once stuck in the mud with the characters, is liberated to move and cut in fantastical ways: a man is beheaded but his separated face continues to jabber, the group starts to get shot by arrows that seem to come from nowhere (in the beginning we see the Indians shooting them), and Aguirre continues to deliver his grand, narcissistic speeches as those around him die off. The beginning of the film clearly defines its spaces through screen direction, but when Aguirre and the rest of the group become disoriented, it’s almost impossible to find out whether they’re going north, south, east or west. Like the raft that gets stuck early in the film, it feels like they come to a stand-still, going in circles as the camera frequently oscillates around the raft. Similar to how Hitler’s pursuits led to no city of gold, Aguirre is left spinning, moving to no end goal as everyone around him perishes. But perhaps the film’s best and most powerful moment comes as the natives peacefully come to Aguirre’s raft to talk and form a relationship. They are immediately put in shackles and bound. All hope of a two-way relationship is lost; they are merely tools for the colonizers, treated as sub-human. A monk hands them a Bible and tells them that it is “the word of God.” The Indians hold the book to their ear and hear nothing. For blasphemy they are immediately killed. It’s shocking how relevant this scene is today. America, the supposed police of the world, has entered other countries without respecting or understanding other countries. It imposes its own beliefs on others without any empathy for another culture. The US’ message is not Christianity but democracy, capitalism, and freedom. The indigenous people put this to their ears and hear nothing. The concepts are so foreign and so improperly imposed that there is no potential for a healthy relationship. “Whoever follows me and the river, will win untold riches. But whoever deserts…” Our leaders rule over others with narcissism without realizing that they are in harsh terrain and ill-equipped for the job, heading towards a myth of utopia that doesn’t exist. 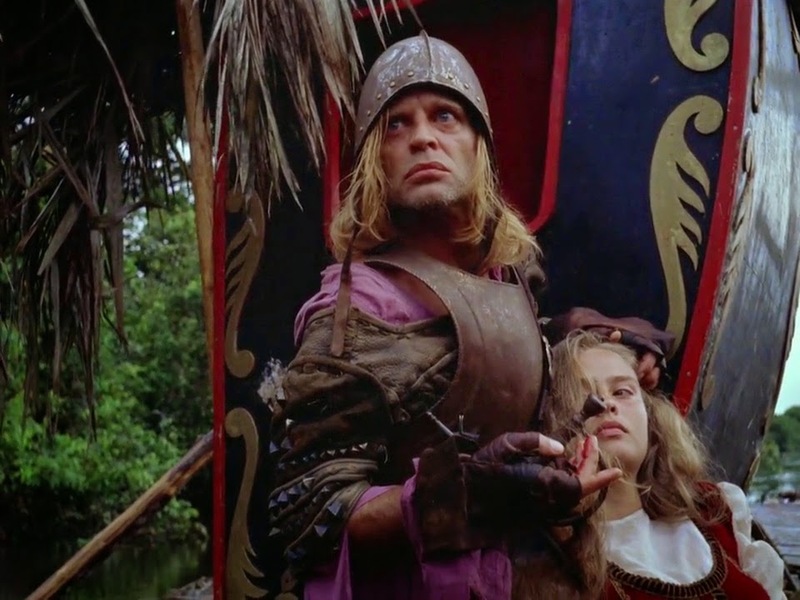 Aguirre, The Wrath of God is not just about a group of fifteenth-century explorers but is a poignant reflection of the world we still live in. It’s not pretentious, self-indulgent, or boring. It’s a cinematic and allegorical reflection of our mad, mad world.